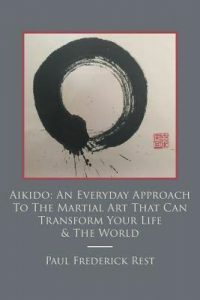 Sensei Noha provides an excellent in depth review of the book “Aikido: An Everyday Approach To The Martial Art That Can Transform Your Life & The World”, by Paul Rest. Paul Rest’s book offers practices that are straightforward and practical ways to applying Aikido off the mat. The practices are illustrated with entertaining examples from his own life and practice. Paul Rest has been practicing Aikido for over 20 years and holds the rank of 4th dan. He has trained with many of the top instructors in the US and in seminars with some of the leading teachers from Japan including the current Doshu, Moriteru Ueshiba. He is also a pioneer in Low Impact Aikido, an area of growing interest in the Aikido world. Low Impact Aikido is an opportunity for students to practice the art who are not able to take falls. This will be the subject of a forthcoming book. Section I – Mind/Body/Spirit- contains three chapters entitled Mind, Body and Spirit respectively. These chapters provide a unique perspective on these concepts. This section focuses on the unity of mind, body and spirit, a core principle of Aikido practice. There are numerous insights from Paul’s many years of training and teaching as well as examples from other people, which illustrate mind, body, spirit unity. Section II – Aikido and You – Aikido in the World – contains eleven chapters that help us to work with basic activities such as standing walking and turning and how Aikido can help us take these fundamental movements and create opportunities for training. The later chapters in this section provide similar practices using different parts of the body such as eyes, hands and fingers and skin. These types of exercises may seem simplistic but that is a big part of their value as they can be done in the most ordinary places while performing the most ordinary of tasks. My own experience with them has helped to turn grocery shopping from a task I don’t enjoy to something I look forward to as a chance to train. Section III-Provides an example of one of Paul’s classes, his thoughts on Low Impact Aikido and a glossary of terms. The book is well worth reading because it offers practices to take the art off the mat that are practical and can be used in our most basic daily life situations, such as the supermarket examples. Working with these practices will enhance daily life activities and also help to improve your Aikido on the mat as well. It is available on Amazon in both printed and ebook formats.